Sunday, February 5, 2012, 10 a.m.
Free Discover the Prospect Park you never knew! Meet birds and other wildlife on this walk, guided by a naturalist. Guide: Andrew Baksh or Urban Park Rangers. With the Van Cortlandt Park Conservancy, NYC Department of Parks and Recreation, and Urban Park Rangers. Meet at Van Cortlandt Nature Center. 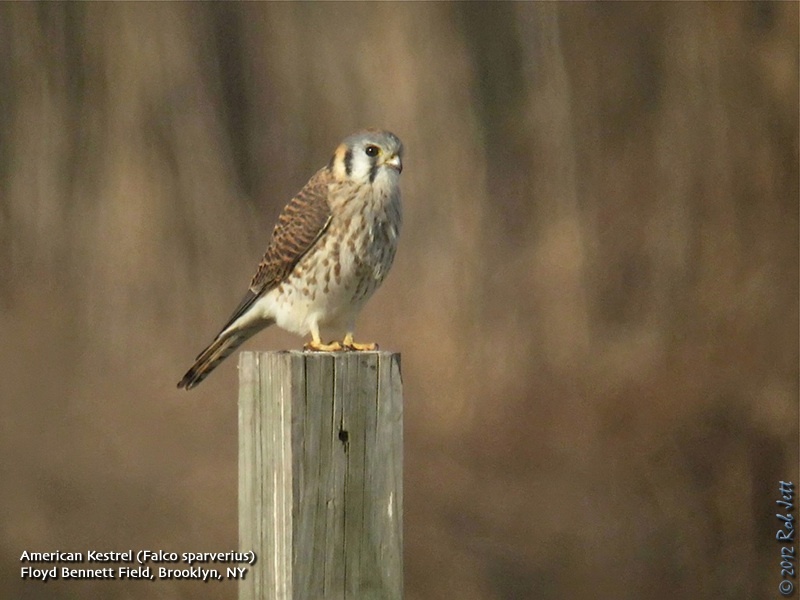 The history of birding and Van Cortlandt Park are inseparable. Influential birders such as Roger Tory Peterson and Allan D. Cruickshank got their starts on Van Cortlandt’s ecologically diverse grounds. These walks celebrate the tradition set forth by these great ornithologists. Participants will look for various species of residents and migrants and discuss a wide range of avian topics. For more information, please call 718-548-0912. No registration necessary. No limit. Free. Saturday, February 4, 2012, 12 noon to 2:00 p.m.
Sunday, February 5, 2012, 6:00 p.m. to 8:00 p.m.
Join owl enthusiast, Cliff Hagen, for the 3rd annual Super Bowl Owl Prowl, a chance to seek out, listen to and possibly watch our nocturnal neighbors of Pouch Camp. Meet in the Nevada Avenue parking lot of High Rock Park. Though flashlights are not necessary, they are acceptable. For more details call Cliff Hagen at 718-313-8591. Greetings. This is the New York Rare Bird Alert for Friday, January 27th, at 7:00pm. The highlights of today's tape are SLATY-BACKED GULL, PINK-FOOTED GOOSE, RUFOUS HUMMINGBIRD, SNOWY OWL, Audubon's form of YELLOW-RUMPED WARBLER, COMMON REDPOLL, and more. Though slightly north of our normal coverage area, last Saturday an adult SLATY-BACKED GULL was spotted and photographed on the Hudson River off the Beacon train station in Dutchess County. This site is south of the Newburgh-Beacon Bridge off Route 9D. Follow signs to the station and park on the Hudson side of the tracks to view the cove that the Slaty-backed visited. The gull has not yet been re-sighted, but lots of gulls have been on the river there, including one or two GLAUCOUS GULLS, at least five ICELAND GULLS, and LESSER BLACK-BACKED GULLS. On Wednesday a PINK-FOOTED GOOSE was found in Queens, at the Alley Restoration Area, a newly-created marshy pond that lies between the Cross Island Parkway on its west side, the Long Island Expressway to the north, and Douglaston Parkway on the east side -- an approach being West Alley Road that runs along the south side, but access is difficult. The goose has not been noted there since, but it likely remains in the area. A WILSON'S SNIPE and PALM WARBLER were also spotted there. At this time of year, Wilson's Snipe can also be found in unfrozen, muddy, marshy areas adjacent to water bodies. The RUFOUS HUMMINGBIRD still survives at the American Museum of Natural History, seen through today around the plantings and feeders on either side of the entrance to the planetarium off West 81st Street. The white SNOWY OWL was still in the Jones Beach West End dunes between the swale in front of the West End 2 parking lot building and the West End jetty on Wednesday. Please enjoy this spectacular owl, but keep your distance so as not to disturb it. Also in the Jones area, over 100 RAZORBILLS were estimated around Jones Inlet Thursday. A good sign for Saturday's pelagic trip out of Freeport. If interested in this trip [January 28th], call See Life Paulagics at (215) 234-6805. The Audubon's form of YELLOW-RUMPED WARBLER continues at Sunken Meadow State Park. Look for it around the fenced-in juniper clump at the eastern end of the easternmost parking lot or along the river just south of there. The GREATER WHITE-FRONTED GOOSE was noted again last Sunday at Gerry Pond Park in Roslyn, but it does move around. A EURASIAN WIGEON has been present recently in New Rochelle, Westchester County, visiting the pond with dozens of American Wigeon off the west side of Church Street, just a short distance south of the light on Pelham Road. The school ball field across Church Street from this pond has several Monk Parakeet nests in the light stanchions. Also in Westchester, three RAZORBILLS were still off Read Sanctuary Playland Park in Rye on Thursday. On eastern Long Island, a COMMON REDPOLL was found Tuesday feeding near Tiana Beach, off Dune Road, west of Shinnecock Inlet. Historically there have been late pushes of some winter finches into our area in late January and early February, but this year they have been notably absent so far throughout our region. An immature LESSER BLACK-BACKED GULL was at Shinnecock Inlet on Sunday, and a GREATER WHITE-FRONTED GOOSE visited Hook Pond in East Hampton on Wednesday. We have no positive word on either the Calverton MOUNTAIN BLUEBIRD or the Eastport BARNACLE GOOSE. The ICELAND GULL does continue to visit Iron Pier Park at the end of Pier Road in Northville. An immature RED-HEADED WOODPECKER is wintering at the Baiting Hollow Boy Scout Camp off the north side of Sound Avenue. This site is about a half mile west of Edwards Avenue. The woodpecker is usually in trees about 200 yards in from the parking lot where the trail parallels the water course lower down on the left. 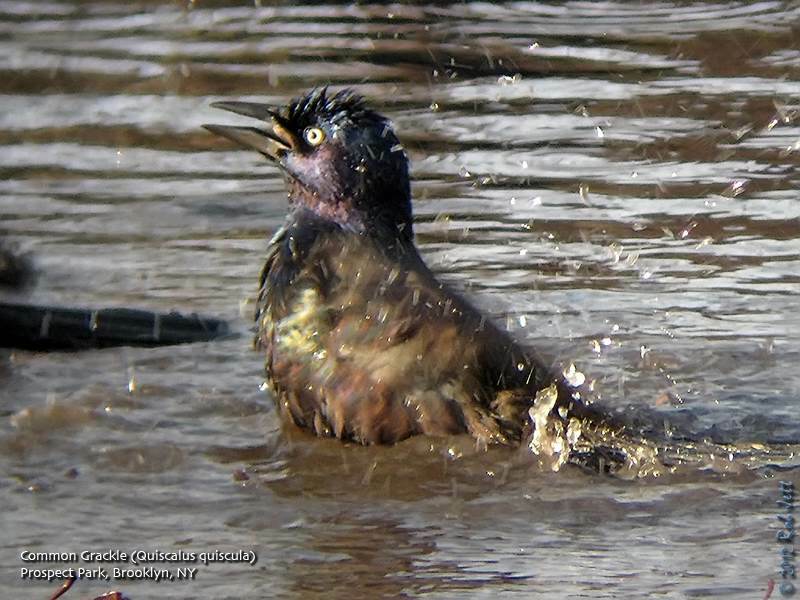 The glossy feathers of this Common Grackle bathing in a puddle iridesced in the late-day sun, highlighting this specie's metallic hues of bronze, purple, blue and green. Uncommon in NYC parks in the winter, there is currently a flock of about 500 hanging around the south edge of Brooklyn's Prospect Park. 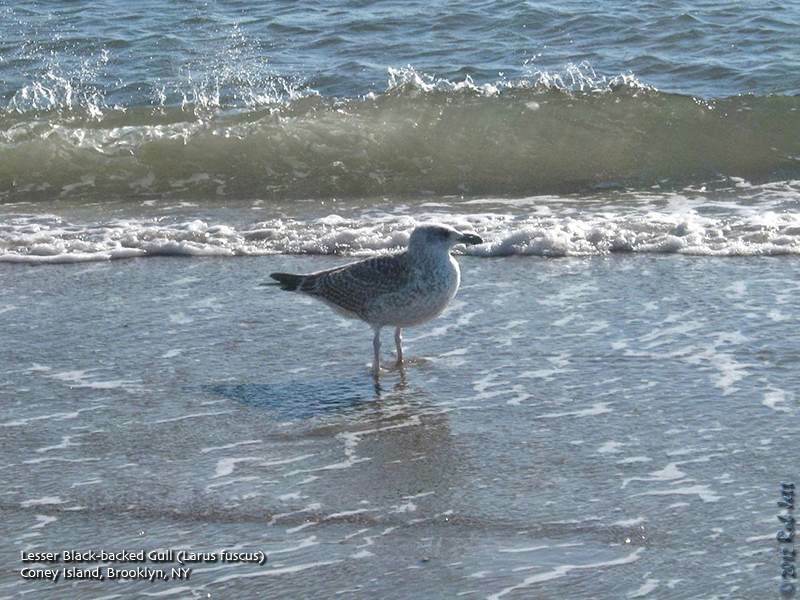 My friend Peter reported that a very unusual seabird was recently found along Brooklyn's coast. 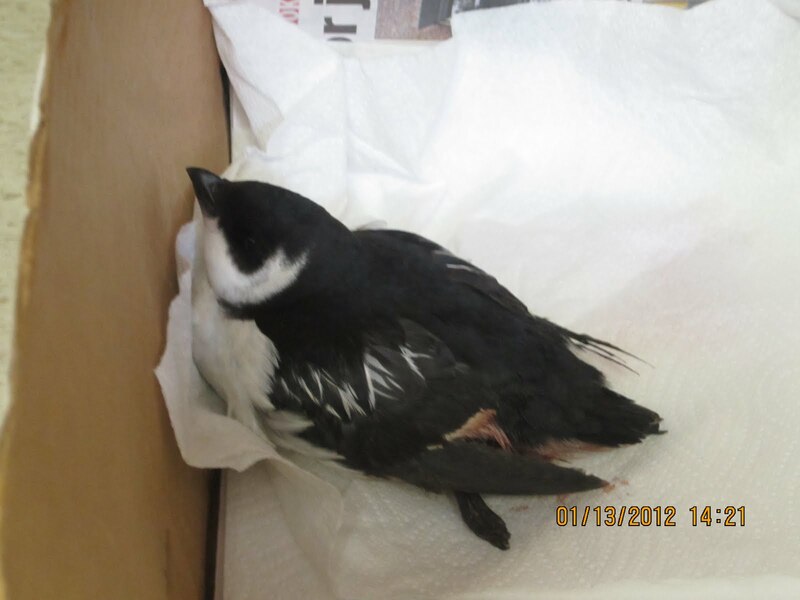 On January 13th, an injured Dovekie was spotted by the foreman at a construction site at Bush Terminal. The collapsing piers in this area are being turned into a park, fortunately for this little bird, there were caring people around. This stretch of waterfront is closed off to the public so, normally, this former industrial park would be nearly devoid of human. I did a waterfowl count here a few years ago and found that hundreds of ducks are drawn to the old dilapidated wharfs. There was also a very scary-looking pack of feral dogs wandering around. I have a bad habit of referring to a large quantity of birds as a "ton" of birds. For example, within the last week large numbers of Ruby-crowned Kinglets have been moving through Prospect Park. These tiny, energetic birds have been eating their way through the park on their way north. When a friend asked me about the recent status of the migration in the park I reported to him that there were suddenly a ton of kinglets around. I began to think about my use of the specific quantitative evaluation when it probably would have been more accurate if I had used more general terms like "abundant" or "fairly common". Could there have been literally a ton of those four inch long balls of feathers in Prospect Park's 526 acres? I decided to do the math. Number of Ruby-crowned Kinglets it takes to equal a ton = 139,567. So after my neighbor Andy and I saw that merganser flock I get a text from him saying that if a merganser is just over 3lbs on average, there must have been about 10 tons of duck out there! Having tried in vain for years-to see a ton of birds with you, it was sad to finally reach this goal without you. "The Symphony of Science is a musical project of John D Boswell, designed to deliver scientific knowledge and philosophy in musical form." Below is his latest video. Depart Bylane Farm at 8:00 am. Saturday, January 28, 2012, 9:45a.m. to 3:45p.m. Come join others who enjoy a cold day outdoors. It is ten moderate miles at a comfortable pace. Meet at the beginning of the Blue Line Trail at the end of Staten Island Boulevard, off Ocean Terrace by the Sunnyside campus of Petrides complex. Bring lunch and beverage and sturdy walking shoes. Dress warmly in layers. We go in all weather. Come see what the winter woodland has to offer; winter birds, bare forest trees, frozen ponds, evergreens and possible snow. Saturday, January 28, 2012, 12 noon to 2:00 p.m.
Saturday, January 28, 2012, 2:00 p.m. to 3:30 p.m.
Watch the comings and goings of wintering birds from inside the warm comforts of the Blue Heron Park Nature Center. Discuss ways to attract birds to feeders, the benefits of offering a variety of food types and the needs of our wintering feathered friends. Meet inside the Blue Heron Park Nature Center on Poillon Avenue. For more information call Ellen Pratt at 718-948-2662. Sunday, January 29, 2012, 6:00 p.m. to 8:00 p.m.
Join owl enthusiast, Cliff Hagen, for a dark, quiet walk along the snow-covered trails of Blue Heron Park in search of the sounds of courtship in the frozen woods. 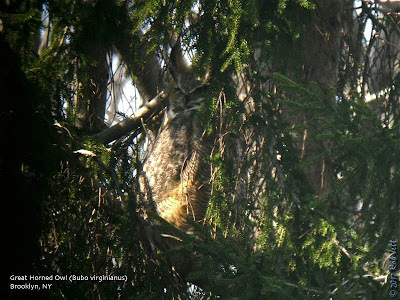 Listen for the deep hoots and soft whinnies of Great horned and Screech owls that reside in our island’s parks. Meet in the Blue Heron Park Nature Center parking lot. Though flashlights are not necessary, they are acceptable. Join us for an hour-long tour of seasonal garden highlights. Greetings. This is the New York Rare Bird Alert for Friday, January 20th 2012 at 8pm. The highlights of today's tape are GYRFALCON, MOUNTAIN BLUEBIRD, RUFOUS HUMMINGBIRD, LITTLE GULL, BLACK-HEADED GULL, EARED GREBE, SNOWY OWL, BARNACLE GOOSE, GREATER WHITE-FRONTED GOOSE, DICKCISSEL and more. Firstly, the pelagic trip now scheduled for Saturday, January 28th from Freeport still needs some more participants to sign up to ensure sailing so if interested please call See Life Paulagics at (215) 234-6805 or visit the website at < http://www.paulagics.com >. Last Saturday afternoon a GYRFALCON was spotted sitting in a tree along the Wantagh Parkway just north of the Zach's Bay amphitheater. The falcon took off flying north along the Wantagh harassed by a Peregrine the GYRFALCON veered to the northwest and disappeared but the bird was looked for but not seen on Sunday and subsequent days but could still be in the area of Great South Bay, definitely worth watching for. Also in the Jones Beach area the white SNOWY OWL remains in the dunes between the West End jetty and the West End 2 concession building. The immature LITTLE GULL was seen among the Bonaparte's Gulls inside Jones Inlet on Tuesday and a good number of Bonaparte's have been present lately often feeding out in the ocean. A few RAZORBILLS continue around Jones Inlet, a GLAUCOUS GULL was seen again on the bar off the Point Lookout Fireman's Park last Saturday and an ICELAND GULL appeared near the West End Coast Guard Station on Wednesday. Certainly unexpected on the Point Lookout bar last Sunday were singles of SEMIPALMATED PLOVER and PIPING PLOVER. Among the passerines at Jones Beach an ORANGE-CROWNED WARBLER was near the field 10 entrance Sunday and 2 "IPSWICH" SPARROWS were around the West End 2 parking lot. The RUFOUS HUMMINGBIRD is still present, but not all the time, around the entrance to the planetarium off 81st Street at the American Museum of Natural History, watch for it feeding in the plantings on either side of the entrance. The immature RED-HEADED WOODPECKER also remains in Central Park around the northwestern area of the fenced in Hallett Sanctuary in the southeastern corner of Central Park. A couple of YELLOW-BREASTED CHATS continue in Manhattan, one in Bryant Park along the front of the public library off 5th Avenue just south of 42nd Street and one in Union Square Park off East 14th Street. The bright DICKCISSEL remains at Inwood Hill Park in northern Manhattan in the large House Sparrow flock usually around the ballfields at the western end of Dyckman Street and a GREATER WHITE-FRONTED GOOSE can still be found in Van Cortlandt Park. 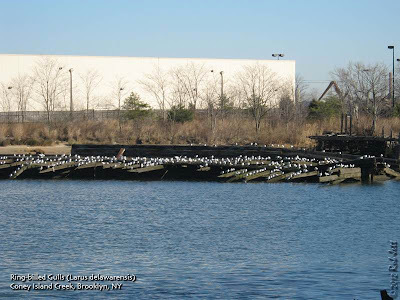 The adult BLACK-HEADED GULL continues to visit the Owl's Head waste water treatment plant in Brooklyn and may also be seen on the adjacent Veteran's Memorial Pier and 2 BALD EAGLES were spotted over Prospect Park on Wednesday. 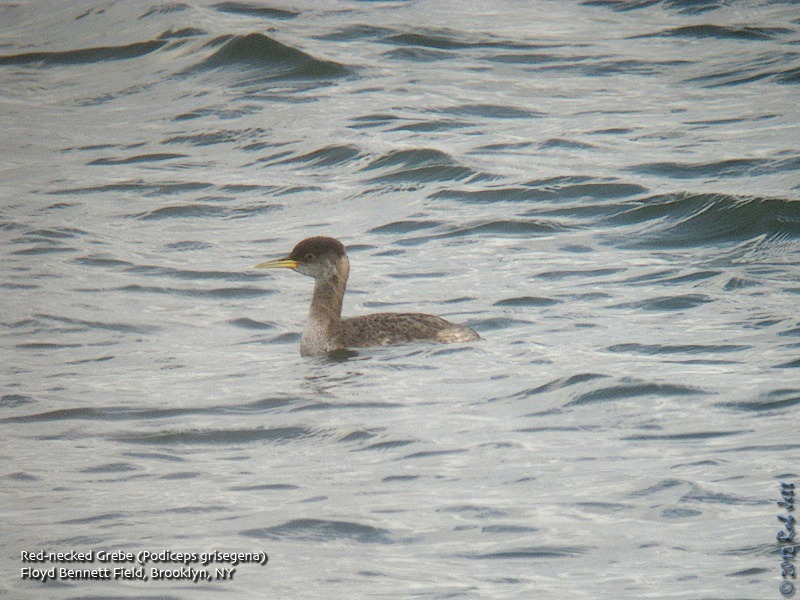 At Jamaica Bay Wildlife Refuge the EARED GREBE continues off the Broad Channel community with the EURASIAN WIGEON still on the mostly frozen East Pond on Tuesday. Another SNOWY OWL was at Atlantic Beach on Monday. The LESSER BLACK-BACKED GULL remains by the Silver Gull Club at the western end of Fort Tilden and 2 RED-NECKED GREBES and a GLAUCOUS GULL were off Coney Island on Tuesday. Single GREATER WHITE-FRONTED GEESE have been noted recently at Gerry Park off Northern Boulevard in Roslyn and last Sunday at the Hauppauge High School off Lincoln Boulevard. The MOUNTAIN BLUEBIRD was still in Calverton last weekend using fencing in fields east of Hulse Landing Road reached by walking east along the power line seen north of Route 25A. Also watch the Route 25A snow fence. Continuing east the BARNACLE GOOSE was still with Canadas Sunday on the Eastport Pond on the north side of Route 27A (Montauk Highway) on the east side of Eastport and it's also been seen in fields around the intersections of Route 27 and Route 51 a little northwest of the pond. Last Saturday there were 2 GREATER WHITE-FRONTED GEESE and a CACKLING GOOSE on Short's Pond off Scuttlehole Road north of Watermill, another White-front along Daniel's Lane in Sagaponack and an ICELAND GULL at Hook Pond in East Hampton. Two COMMON RAVENS were at the Hampton Bays water tower Sunday. An ICELAND GULL and a LESSER BLACK-BACKED GULL continue at Iron Pier Park at the end of Pier Road in Northville and a CACKLING GOOSE was reported from Marratooka Lake in Mattituck Monday. I received a text from Doug Gochfeld Wednesday morning that he was looking at an adult Bald Eagle in Brooklyn's Prospect Park. The bird was circling Prospect Lake. I rushed into the park, but by the time I got to the lake it was nowhere to be found. I sat at the edge of the lake hoping the bird would return, but after a 35 minute vigil I headed back across the park, eagle-less. I ran into Doug near the Maryland Monument and we stood talking for a few minutes. From that location there is an obstructed view of the lake, so when we saw all the gulls and geese take flight, we hurried down Wellhouse Drive towards the commotion. As we passed the Peninsula Meadow, to our left, we spotted a third year Bald Eagle flying towards us. I should note that the eagle seen by Doug earlier was an adult. The raptor continued flying above us and over Lookout Hill. About 3 minutes later, as we walked to the edge of the lake, we observed a second Bald Eagle soaring over the lake. 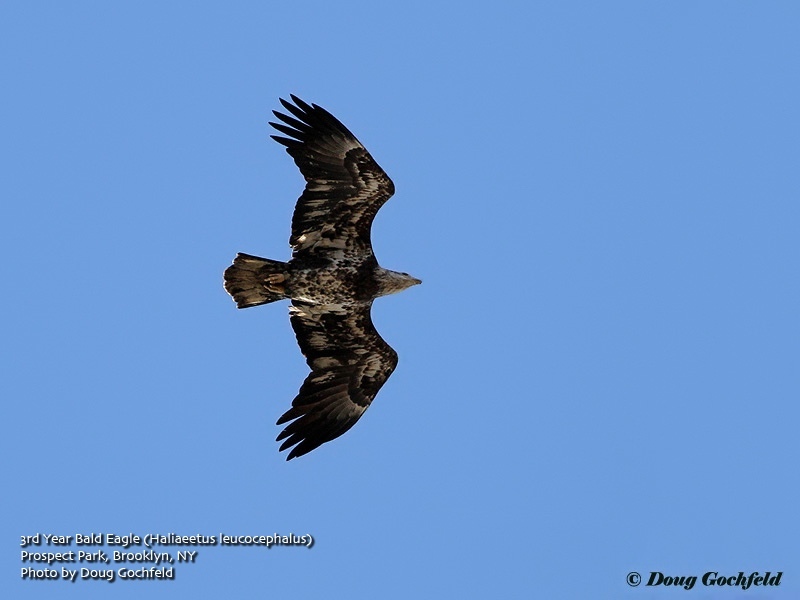 This one was an adult bird and likely the same individual Doug spotted earlier as he noted that it was missing a flight feather on its right wing. 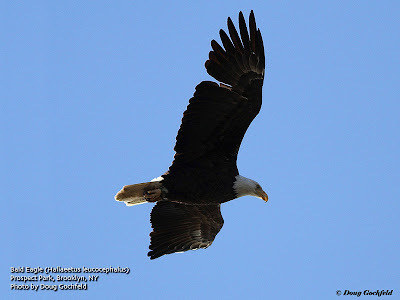 It appears that there has been an adult Bald Eagle hanging around Brooklyn since last Fall. 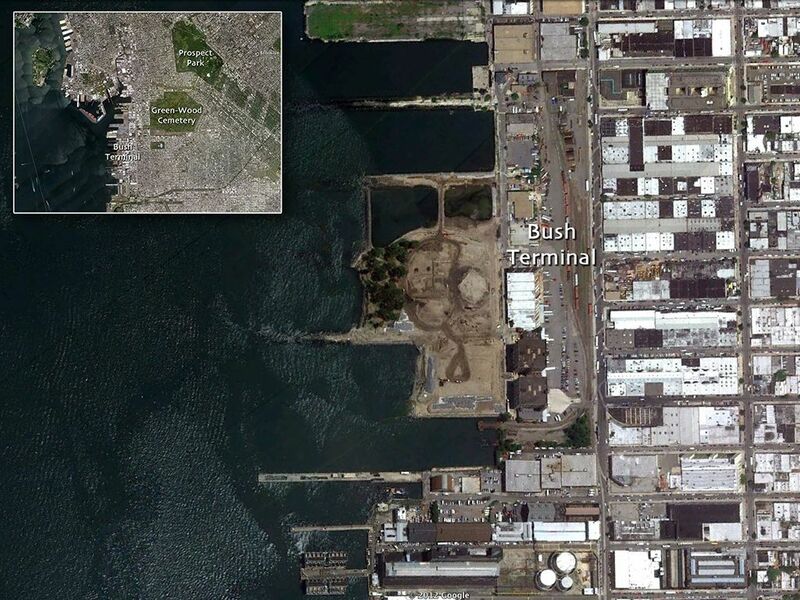 Peter Dorosh posted a photo of one seen in Bush Terminal late last October (not far from Green-Wood Cemetery). Joe DiCostanzo spotted one in Green-Wood Cemetery on a Thanksgiving stroll. Marge Raymond photographed one in Green-Wood Cemetery while leading a tour on December 7th. Subsequent to that there were several unsubstantiated sightings in the cemetery by landscape workers, but then someone photographed it on January 6th and posted the image here. Bald Eagles aren't a super-rarity in New York City as there are usually a few sightings of migrating individuals each year. To have one hanging around Brooklyn, however, is very unusual and kinda cool. 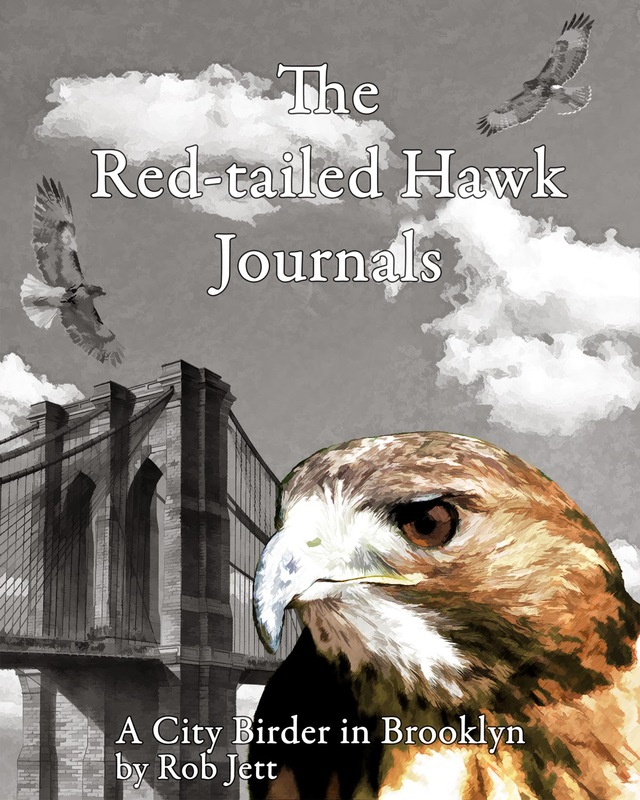 I wonder if the newspaper "The Brooklyn Eagle", which began in 1841, took their name because Bald Eagles could be seen around coastal Brooklyn in the 19th century. Here's a good photo page that shows the five-year plumage transition of Bald Eagles. The Northern Mockingbird is one of three species of mimic thrushes regularly found around New York City. 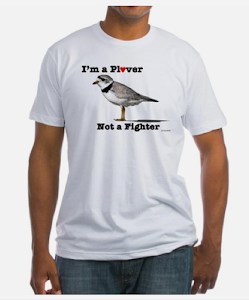 Mockingbirds are a pugnacious species and will vigorously defend their territory against any perceived threat. I've witnessed, on many occasions, one of these robin-sized gray birds attempting to drive off a Red-tailed Hawk by repeatedly hitting it on the back of the head. Look for these birds in winter safeguarding their claimed fruiting tree, shrub or vine. This individual was in the vicinity of a stand of Yew trees. ...sort of. As a follow up to the Snow Goose story, I brought Marge over to Coney Island Creek to look for her possible former ward. Our hope was that it would hear her voice, remember the care she gave this goose from 2005-2009 and come running (with a sappy orchestral crescendo playing in the background). Apparently those things only happen in the movies. We quickly relocated the Canada Goose flock with the lone Snow Goose feeding on the field at Six Diamonds Park, across Coney Island Creek from Mark Twain Junior High School. Marge slowly approached the flock and began calling "Mommy", her name for the goose with the bent wing. At one point it appeared that the bird recognized her, even calling a few times, but then went back to eating grass. Marge thought that, perhaps, the goose just couldn't hear her. I didn't think that was the case and remarked that the deceased over in Green-Wood Cemetery could probably hear her. A minute later a raptor flew over the field and the panicked birds all flew off to the safety of the creek. "A 3.5 mile stretch of the old Rockaway Beach Branch railroad right-of-way currently lies abandoned in Central and Southern Queens. Over the past 60 years, since rail service ended, it has become a dumping ground for garbage, abandoned cars and other debris, and is one of the largest tracts of unused land in an area populated by hundreds of thousands. An incredible opportunity exists to transform this abandoned, unsightly and in many places hazardous space into a beautiful 3.5 mile public park extending south from Rego Park to Ozone Park. A multi-use path would provide a recreational and commuter corridor through Rego Park, Forest Hills, Woodhaven, Richmond Hill and Ozone Park. It would link these communities with Forest Park and the Brooklyn-Queens Greenway and to nearby bike lanes leading to the recreational spaces of Rockaway Beach and Jamaica Bay, including the Shore Parkway path, Jamaica Bay Wildlife Refuge and Gateway National Recreation Area. It would also connect at least five subway lines and numerous commercial districts, shops and schools. greenspace, sports facilities and community gardens could be created for family recreation and for use by the several schools along the route. A safe bicycle route parallel to Woodhaven and Crossbay Blvd. 's would exist so that people could ride to school, go shopping, visit friends, reach public transportation or simply enjoy a sunny day." Return of our Snow Goose? Back on December 9th Heydi and I discovered a Ross's Goose on Coney Island Creek. A few minutes later we spotted an American Avocet (and quickly forgot about the goose). Within a day the Ross's Goose disappeared only to be replaced by the very similar Snow Goose. At first, some of us suspected that the Ross's was just being misidentified as a Snow. 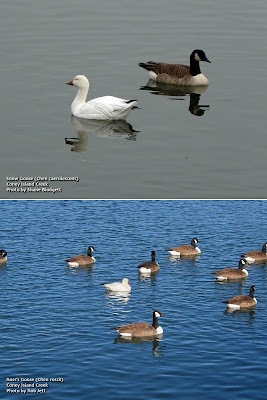 It wasn't until Shane took a photograph of the "replacement" goose that we realized that it was, indeed, a Snow Goose. It was a peculiar situation for a couple of reasons. 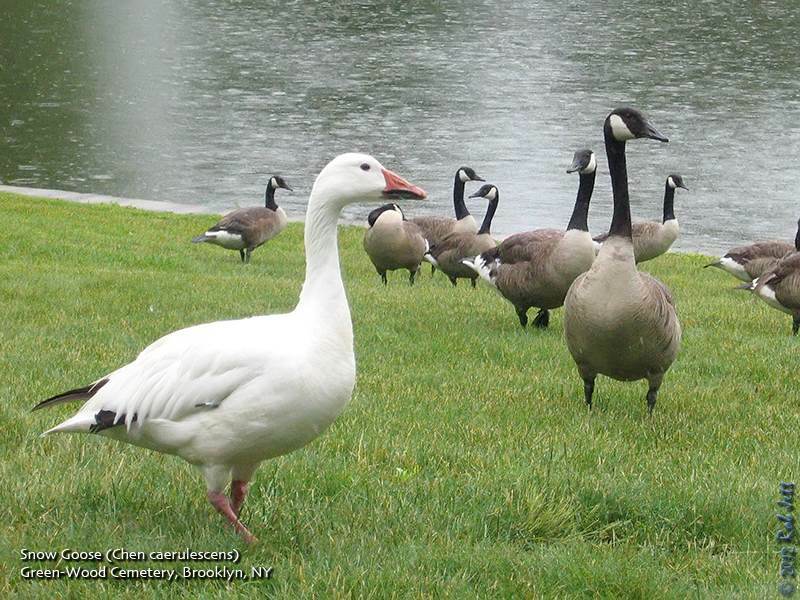 First, it is very unusual for either species of white goose to be present on Coney Island Creek. Second, to have one take off just as the other, extremely similar, species arrived succeeded in confusing more that a few birders. But this odd story doesn't end there. 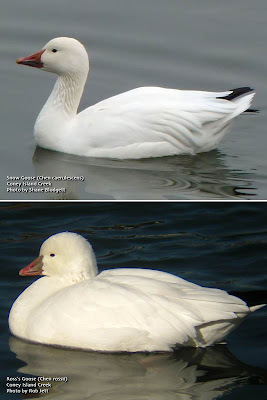 Once Shane sent me the photo of the Snow Goose, I thought it would be the perfect opportunity to create a posting that compares the two white geese of Coney Island Creek. It wasn't until I had been looking at the Snow Goose photo for a while that I realized that there was an even more interesting story to be told, but first let's look at these two birds. The top photo is of the Snow Goose, the lower is the Ross's Goose. Both are nearly all white with black wing tips. The most obvious difference between the two species is the bill size and shape. The Ross's has a much smaller, shorter bill with little or no "grin patch". The bill is also more triangular than the Snow's (specifically, a right triangle). Note also that the Ross's often has a bluish color to the base. The Ross's also has a smallish, rounded head. Notice the steep slope of the Snow Goose's head. I don't know if it's typical of all Ross's Goose, but this individual also seems to have a very small eye. Even keeping in mind the large size range for Snow Geese, there is still a significant difference in bulk between the Ross's Goose and the Snow Goose. There is nothing better than field experience for learning to separate these two similar birds, but given the Ross's Goose rarity around New York City, I hope this helps. Now for the other part of this Brooklyn story. Saturday, January 21, 2012, 10 a.m. to 2:00 p.m.
Meet at the entry road to the Eger Home close to the intersection of Manor Road and Rockland Avenue. We will collect trash from the borders of the pond and the wooded edges of the roads. Protectors will supply bags and, if you don’t have your own, gloves. After a two hour work session (our 187th consecutive monthly workshop), we will take a short walk over nearby trails. Sunday, January 22, 2012, 11:00 a.m. to 2 p.m.
Meet at the Nature Center at Rockland and Brielle. We will follow the White Trail south to Nevada Avenue and back. Those interested in a shorter walk can meet us at 12:00 noon at the side of Meisner Road (toward the Eger Home) by the intersection of Meisner and Rockland. Call Hillel Lofaso at 781-751-6629 for more details. Greetings. 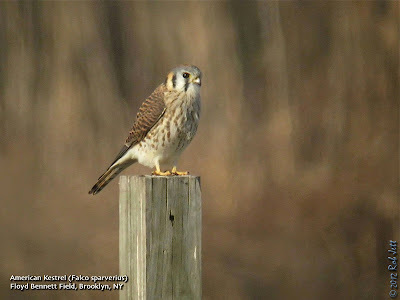 This is the New York Rare Bird Alert for Friday, January 13th 2012 at 7pm. The highlights of today's tape are RUFOUS HUMMINGBIRD, MOUNTAIN BLUEBIRD, EARED GREBE, BLACK-HEADED GULL, SEDGE WREN, NORTHERN SHRIKE, BARNACLE GOOSE, BARROW'S GOLDENEYE, SNOWY OWL and more. Firstly, the pelagic trip from Freeport scheduled for tomorrow has been postponed, due to the weather, until January 28th. In Manhattan a RUFOUS HUMMINGBIRD continues in flowers alongside the entrance to the planetarium off 81st Street at the American Museum of Natural History though it has also been reported recently in adjacent Central Park southeast of Tanner's Spring. The immature RED-HEADED WOODPECKER remains in the northwestern part of the fenced off Hallett Sanctuary in the southeastern section of Central Park. The YELLOW-BREASTED CHAT lingering at Bryant Park has been frequenting the front of the library off 5th Avenue just south of 42nd Street while in northern Manhattan a bright DICKCISSEL continues with House Sparrows at Inwood Hill Park usually around the ballfields in the southwestern portion of the park. 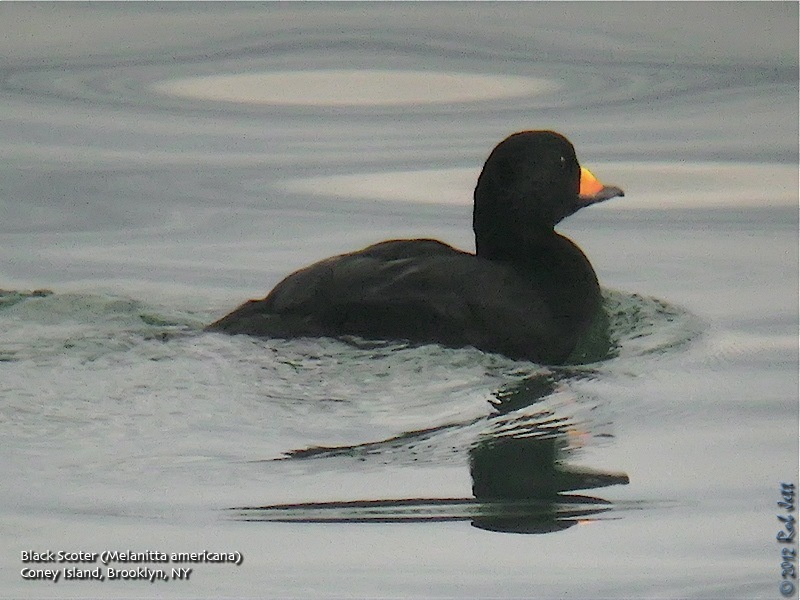 Two ORANGE-CROWNED WARBLERS were at Swindler's Cove in northern Manhattan recently and in The Bronx the adult GREATER WHITE-FRONTED GOOSE can still be found around the lake, golf course or Parade Grounds at Van Cortlandt Park. Prospect Park too has had ORANGE-CROWNED WARBLER recently along with a lingering BLACK-AND-WHITE WARBLER. At Jamaica Bay Wildlife Refuge the EARED GREBE continues in the bay south of the West Pond usually much closer to and best seen from the Broad Channel community. The drake BARROW'S GOLDENEYE also remains in the bay seen Sunday with a dozen Common Goldeneyes fairly far out as viewed from the trail around the southwestern corner of the West Pond. A drake EURASIAN WIGEON can be found on the East Pond as viewed from the Big John's Pond overlook, the Wigeon usually a little to the north. Also a BARN OWL can sometimes be seen in the owl box on the north side of Big John's Pond visible from the blind on the south side. Please view the owl only from the blind and do nothing to provoke it. On Saturday among the many Snow Geese moving over the East Pond was a very small goose possibly a ROSS'S GOOSE, something to look for. The NORTHERN SHRIKE was still present along the northern runways at Floyd Bennett Field last Monday but it can be very elusive and at least 7 RED-NECKED GREBES were counted from the boat launch area there on Sunday. The adult BLACK-HEADED GULL continues at Owl's Head waste water treatment plant in Brooklyn observable from the down slope at Owl's Head Park adjacent to 68th Street which gives a good view of the active plant area. An adult LESSER BLACK-BACKED GULL was by the Silver Gull Club just west of Fort Tilden's fisherman's lot Sunday. At Jones Beach West End a very white male SNOWY OWL has been ranging around the dunes from the Roosevelt Nature Center down towards the West End jetty. Please enjoy but do not disturb this owl. On Sunday a GLAUCOUS GULL was seen on the flats off the Fireman's Park at Point Lookout and up to 3 HARLEQUIN DUCKS continue along the Point Lookout jetties with a RAZORBILL noted in Jones Inlet Wednesday when a LESSER BLACK-BACKED GULL was also present at Point Lookout. An Audubon's form of YELLOW-RUMPED WARBLER was spotted at Sunken Meadow State Park last Wednesday. 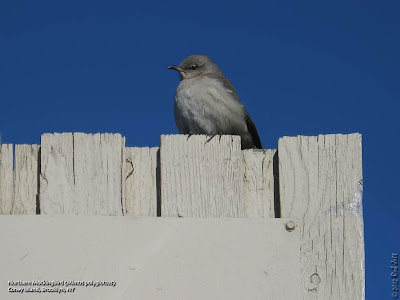 On eastern Long Island a MOUNTAIN BLUEBIRD was still present at least to Wednesday in Calverton most frequently seen foraging along the snow fence on the east side of Route 25A just east of the intersection with Hulse Landing Road. The bluebird also uses the field next to the Haunted House a little farther down Route 25A and fields along the east side of Hulse Landing Road to the north where a NORTHERN SHRIKE has occurred along the power lines there. A BARNACLE GOOSE has been frequenting the pond in Eastport that is on the north side of Route 27A (Montauk Highway) on the east side of Eastport. If not there the Canada flock it is with might be in fields near the intersections of Route 27 and Route 51 a short distance west of the pond. The SNOWY OWL has been staying on an island in Shinnecock Bay east of the Ponquogue Bridge scannable from the end of Road I. Three GREATER WHITE-FRONTED GEESE and a CACKLING GOOSE continue to visit the fields along Further Lane in East Hampton. The SEDGE WREN from the Orient Christmas Bird Count has been re-found a couple of times at Orient Point State Park in phragmites lying off the roadway. ICELAND GULLS lately have featured one at Iron Pier at the end of Pier Road in Northville and one around the Montauk Harbor entrance. Forty RAZORBILLS were counted at Montauk Point Saturday and RED-NECKED GREBES continue in that area. One of several species of raptors that call Brooklyn home during the winter, this Cooper's Hawk was surveying the bird feeders in Prospect Park. 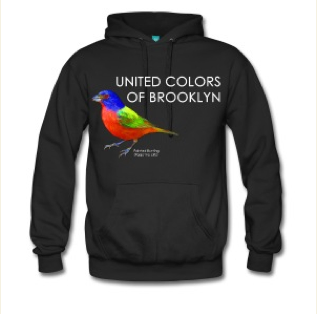 This past Saturday I lead a trip for the Brooklyn Bird Club to Coney Island. As you probably know from recent postings, this has become my new favorite winter spot for exploring wildlife. The weather on Saturday felt more like early-Spring than early-January, so offshore diversity was less than typical for this time of year, however we still managed to see many of the expected winter coastal species. Our group of eleven met at the conveniently located Dunkin' Donuts in the Stillwell Avenue, Coney Island train station. People-wise, Coney Island is a place to expect the unexpected and most individuals, no matter how "different" they appear, rarely get a second look. However, our small group, loaded down with binoculars, spotting scopes and various types of camera equipment seemed to draw an inordinate amount of stares and over-the-shoulder gazes. One would think that after the Gray-hooded Gull birder's circus over the past summer that Coney Islanders would be used to us. Our route took us from Stillwell Avenue to the fishing pier, west to the last jetty before the gated community of Sea Gate, then north along West 37th Street to Coney Island Creek Park. We scanned the water from the boardwalk before heading out onto the pier and found that there was an unusual number of Northern Gannets present. 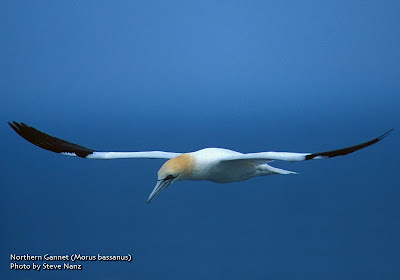 Normally flocks of these large diving birds can only be found on the ocean off of the Rockaway Peninsula, with small numbers venturing into the bay on strong south winds. 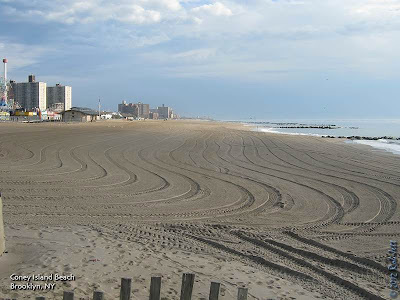 Yes, despite its proximity to the Atlantic Ocean, Coney Island is inside of the Rockaway Inlet and, technically, on the Lower New York Bay. For that reason, the beaches there don't see the large waves that surfers enjoy along the Rockaway Peninsula. Also, the large number of scoters (and occasionally eiders) that can be seen on the ocean from locations, such as, Breezy Point or Fort Tilden are only seen from time to time off of Coney Island. Anyway, I decided to walk out to the end of the Steeplechase Pier to see if we could get better looks at the gannets and any other seabirds as there were a lot of birds that were just too far off to identify positively. From the edge of the boardwalk to the end of the fishing pier is nearly 1/4 mile. Scanning from out over the water at that distance actually makes a big different when one is looking at little specks of birdlife on and above the water. We walked out to the end of the T-shaped wharf. Fishermen lining the edges of the pier jiggled their lines hoping to snag Atlantic Herring. When space opened up at the end of the pier we set up our scopes and scanned the flocks of plunging gulls and lines of flying seaducks. We quickly spotted both Common and Red-throated Loons. I've noticed that one Common Loon seems has taken up residence in the water just below the fishermen and has been hanging around the pier since November. Is it possible that this smart loon noticed that the fishermen attract schools of fish with their rows of shiny, dancing lures? The most abundant duck off the pier appeared to be Red-breasted Merganser, with flocks numbering in the hundreds. Smaller numbers of Long-tailed Ducks were relatively close to the beach. After about 20 minutes on the pier we headed down onto the sand for the walk to the west end. We stopped briefly below the old parachute ride tower to look at a Peregrine Falcon spotted earlier sitting high on the structure. I explained to the group that the majority of gulls encountered sitting on the beach along the route are Ring-billed Gulls. There are also small numbers of Herring Gulls and Great Black-backed Gulls. However, there is always the possibility of a rare gull appearing, so it is important to at least do a quick scan of these abundant birds. Over the last couple of years some unusual gulls found in Brooklyn are Black-headed Gull, Mew Gull, Iceland Gull and the uber-rarity Gray-hooded Gull. 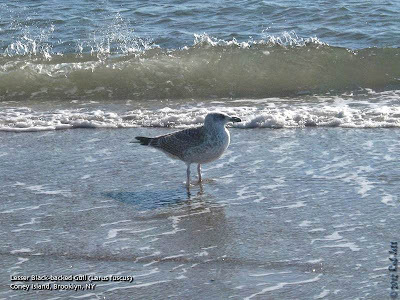 One somewhat rare gull that has been showing up around coastal New York in increasing frequency is the Lesser Black-backed Gull. Heydi and I spotted a juvenile lesser black-backed in Coney Island on January 2nd. I was hoping I'd be able to relocate it for the group on Saturday. The nearly 1 mile walk to the western jetty didn't turn up any rarities but Rusty did spot a pair of Ring-billed Gulls with blue leg bands. I don't recall the numbers but it was not the same banded bird that I found on December 23rd. I'll post the results once Rusty receives them. There were thousands of gulls in the channel off of the jetty, as well as, lots more gannets. There had been a Red-necked Grebe hanging around this area, but we weren't able to find it. One winter visitor that I was able to find for the group was Purple Sandpiper. 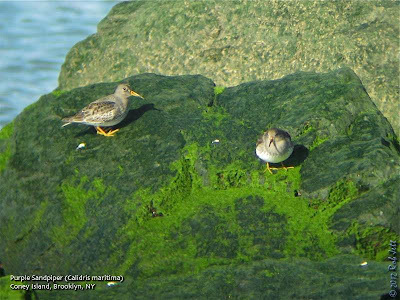 These arctic breeders will hang around the rock jetties in Coney Island until early Spring, when they head back up to the tundra. If you try to find them be sure to look closely between the boulders and rocks closest to the breaking surf. They may not look very purple, but in the right lighting, and especially in breeding plumage, they show a purplish iridescence. 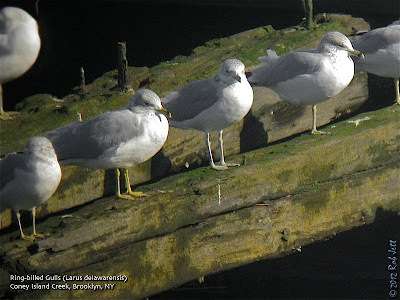 The sand spit on Coney Island Creek was loaded with gulls and, predictably they were nearly all ringed-bills. I say nearly because among the common birds was a single juvenile Lesser Black-backed Gull, likely the same one Heydi and I spotted a week earlier. While we were scanning the gulls a very large adult Cooper's Hawk flew passed us and landed in a tree next to the Mark Twain Junior High School handball courts. It was joined by a second one which perched on top of the court fencing. All of the birds scattered. Then we noticed something rather odd. A squirrel began climbing up the tree in which the hawk was perched. This brazen little mammal came to the branch the held the large raptor and slowly started to walk towards it. Another squirrel appeared to be plastered to the chainlink fence on which the other Cooper's Hawk was perched. Perhaps the squirrel in the tree thought he could entice the hawk to fly, in which case the little gray rodent would scurry away. The hawk didn't budge and the squirrel eventually got bored and slinked away. In all, it was a pretty good trip with most folks adding a few more species to their growing 2012 year list. Saturday, January 14, 2012, 12 noon to 2:00 p.m.
After an examination of the beach geology and the flotsam and jetsam accumulated at the high tide line we will move inland to explore the woodlands. Besides the wildlife we will be looking for old foundations and evidence of human occupation in the past few centuries. Dress sturdily including water-proof footwear and warm clothes. Greetings. 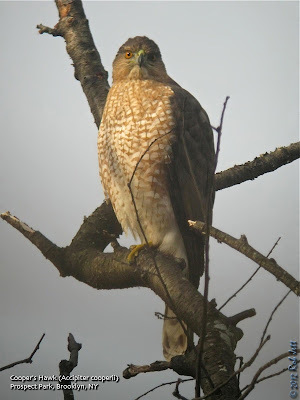 This is the New York Rare Bird Alert for Friday, January 6th, at 7:00pm. The highlights of today's tape are GRACE'S WARBLER, MOUNTAIN BLUEBIRD, RUFOUS HUMMINGBIRD, DOVEKIE, SNOWY OWL, BARROW'S GOLDENEYE, SEDGE WREN, and more. The Southern Nassau Christmas Count on Sunday the 1st recorded 133 species, highlights including a female KING EIDER in Jones Inlet, 3 HARLEQUIN DUCKS around the Point Lookout jetties, BLUE-WINGED TEAL, RED-NECKED GREBE, 20 GREAT EGRETS, YELLOW-CROWNED NIGHT-HERON, RED KNOT and 3 WESTERN SANDPIPERS at Tobay, 8 LONG-BILLED DOWITCHERS, WILSON'S SNIPE and 4 displaying AMERICAN WOODCOCK, singles of LAUGHING GULL, ICELAND GULL, LESSER BLACK-BACKED GULL and GLAUCOUS GULL, 6 BLACK-LEGGED KITTIWAKES and RAZORBILLS, 3 BARN OWLS, a very white SNOWY OWL in the dunes off Jones Beach West End field 2, 2 VIRGINIA RAILS, EASTERN BLUEBIRD, and ORANGE-CROWNED WARBLER. As appealing as these are though, the major excitement centered around a GRACE'S WARBLER discovered in pines at Point Lookout Town Park, this a first record for the Northeast and of course for New York, pending NYSARC approval. The GRACE'S was relocated in the pine stand Monday through Wednesday, usually in the mornings, but could not be found Thursday or today. To reach this spot from the southbound Meadowbrook Parkway, take the Loop Causeway west to Point Lookout, keep to the left, cross Lido Boulevard at the light and enter Point Lookout Town Park. Follow the entrance road past the entrance booth to the stop sign, turn left and continue a short distance to the next stop sign. The warbler was found in the pine stand on the left. 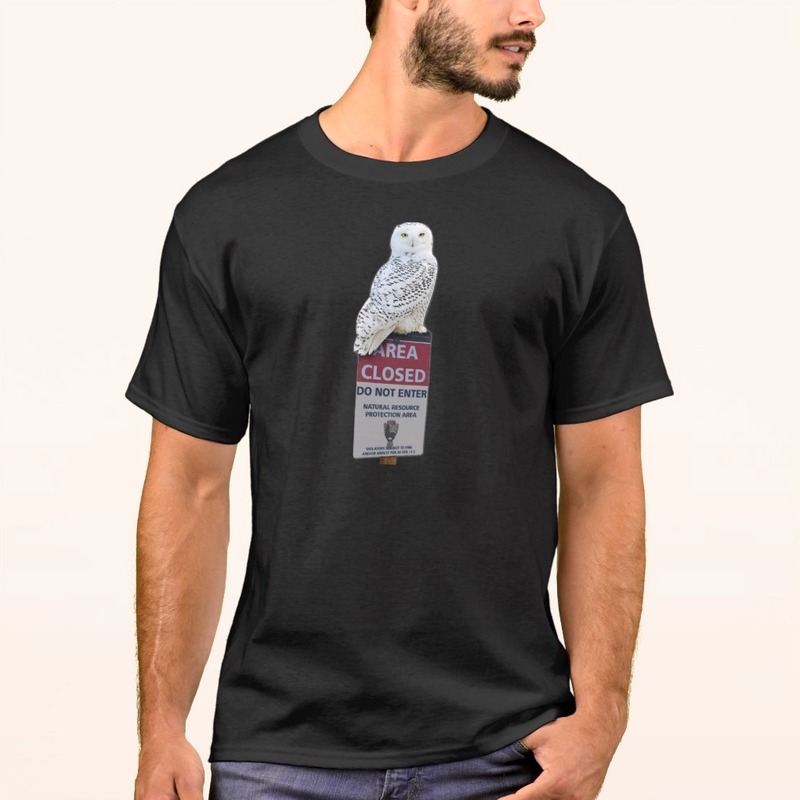 The SNOWY OWL was seen again at Jones Beach West End Tuesday and Thursday but does move around. Look for the GLAUCOUS GULL around the Point Lookout beaches and ICELAND GULL in the West End 2 parking lot. Highlights from the Orient Count last Saturday included a HARLEQUIN DUCK, TURKEY VULTURE, 5 RAZORBILLS, VIRGINIA RAIL, RED-NECKED GREBE, ROUGH-LEGGED HAWK, a SEDGE WREN at Orient Beach State Park, plus HOUSE WREN, 3 MARSH WRENS, and a YELLOW-BREASTED CHAT. The RUFOUS HUMMINGBIRD was still visiting flowers at the American Museum of Natural History today. Look for it feeding at the small yellowish flowers on the west or right side of the entrance to the planetarium on 81st Street. In Central Park an immature RED-HEADED WOODPECKER continues in the northwestern part of the fenced off Hallett Sanctuary in the southeast corner of the park. A bright DICKCISSEL remains with House Sparrows at Inwood Hill Park in northern Manhattan, around the southwest portion of the park near the ball fields. Also there today were a BLACK-THROATED GREEN WARBLER and a NASHVILLE WARBLER. In Bryant Park, a YELLOW-BREASTED CHAT continues in plantings along the Fifth Avenue side in front of the New York Public Library. Unfortunately the second CHAT was found deceased, but also noted there this week have been OVENBIRD, COMMON YELLOWTHROAT, and a LINCOLN'S SPARROW, plus an AMERICAN WOODCOCK today. An ORANGE-CROWNED WARBLER was still in Swindler's Cove Park in upper Manhattan Sunday. The GREATER WHITE-FRONTED GOOSE remains at Van Cortlandt Park in the Bronx. A drake BARROW'S GOLDENEYE was seen on the West Pond of Jamaica Bay Wildlife Refuge last Sunday, and watch for the EARED GREBE in the bay, south of the West Pond trail. A "Black Brant" subspecies of BRANT was spotted from the boat launch area of Floyd Bennett Field Thursday, and a NORTHERN SHRIKE was in the northwestern field today, with 5 RED-NECKED GREBES offshore in the bay. Two ORANGE-CROWNED WARBLERS have been in Kissena Park in Queens lately. The MOUNTAIN BLUEBIRD in Calverton has not been seen since Monday off the Route 25A fields. A NORTHERN SHRIKE was still present Monday along the fields behind the powerlines east of Hulse Landing Road. In Montauk Point a DOVEKIE was found between the restaurant and the lighthouse last Sunday, and reported again on Tuesday. A female KING EIDER and an ICELAND GULL were noted off Camp Hero Sunday, and other lingering birds in that area include a GREATER WHITE-FRONTED GOOSE at the Deep Hollow Ranch off Route 27, RED-NECKED GREBES at Culloden Point, a LESSER BLACK-BACKED GULL at Lazy Point in Napeague, and a GLAUCOUS GULL at Sagg Pond in Bridgehampton. A SNOWY OWL has been present on an island at SHINNECOCK east of the Ponquogue Bridge lately. Look for SHORT-EARED OWL and AMERICAN BITTERN along Dune Road, and two COMMON RAVENS were in Hampton Bays Monday.